If you are planning on buying a forever home, consider features that will serve you best in the future, like energy-efficient appliances, wide halls and zero-entry showers, like this one from Del Webb. The Martin Ray plan at Carolina Orchards in Fort Mill, S.C. Old-fashioned starter homes were designed decades ago to offer homebuyers just the basics: two or three small bedrooms, one or two bathrooms, a functional kitchen, minimal living space and a large backyard that needed a lot of maintenance. Today’s buyers want more than a shoebox that will meet their needs for a few years before they have to trade up. They want a home that’s nicer, bigger and has enough features not just for today, but for many years down the road. 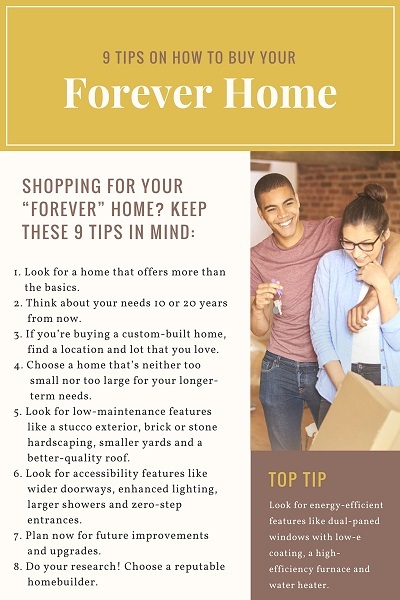 This new desire for a home that’s “forever” isn’t just anecdotal. The federal government recently reported that the proportion of people moving to a new residence over a one-year period fell to an all-time low of 11.2 percent in 2016. The percentage has trended steadily downward since 1985, when it was 20.2, almost double today’s rate. Builders have taken note. Rather than offer buyers starter, trade-up and downsizing homes, they’ve begun to offer buyers homes that are designed to meet their needs for much longer timeframes. “In the last 10 years, new-home construction has now more than ever addressed requirements for buyers of all ages looking for long-term homes,” says Brian McHugh, owner of McHugh Construction. Located in Frederick, Colo., the company builds homes primarily in the greater Denver metro area. The requirements for a long-term home include low maintenance and energy efficiency, features that appeal to a broad range of buyers today. Buyers have come to expect dual-paned windows with low-e coatings and a high-efficiency furnace and water heater at a minimum, McHugh says. Higher-quality appliances are also an important feature for a home’s long-term value. “The better you go, theoretically, the longer you’ll be able to put off replacing it,” McHugh says. Short-term homeowners don’t plan ahead for major home improvements. Long-term buyers start thinking about upgrades and improvements when they shop for a home even if they might not make those changes for 10 years or more. Buyers purchasing a custom-built home are especially likely to focus on long-term benefits. These buyers have chosen a location and lot that they love and are thinking they will stay in their home “forever,” McHugh says. Brett Whitmore, co-owner of Whitmore Homes, a custom home builder in Grand Rapids, Mich., says buyers who are planning for the long term also appreciate features that make a home more accessible. Examples of such features include wider doorways, enhancing lighting, larger showers, zero-step entrances and living spaces for visiting adult children or, eventually, caregivers. Square footage is also a consideration. Buyers’ needs vary and a home’s design can have a big impact on how large or small it feels. Still, most long-term-thinking buyers probably prefer a home that has 2,000 to 4,000 square feet of space. Dennis Ouellette, vice president of operations at national home builder Taylor Morrison in Dallas, says buyers who’ve already owned several homes tend to want at least 2,200 square feet. “They have a good understanding of how they live and what’s important to them,” Ouellette says. Tom Page, vice president of iStar, a community developer in Richmond, Va., and general manager of Magnolia Green, a residential community in Moseley, Va., says it’s “very rare” these days for buyers to purchase a home that’s 5,000 or 7,000 square feet or larger. Selecting the right builder is important whenever a buyer purchases a new-construction home. That importance is magnified when the buyer has a longer time horizon. Page emphasizes the need for buyers to choose a quality builder. “Get referrals from other people the builder built homes for to make sure that not only did they build the home in a quality matter, but that if, six months down the road, some things happen, they do come back and fix it,” he says.